Far and wide the young man travelled in his search. One by one he added to his precious collection of seeds and saplings, but on the way home his ship was wrecked in a terrible storm. The next thing he remembered he was lying on a beach at the foot of a gently-sloping hill. Slowly he lifted his head and looked around. The large, dark-red leaves could not quite hide the heavy bunches of long, green berries with a delicate, almost see-through skin. A warm breeze tickled the young man's nose with the sweet smell of the ripe fruit. The young man picked a handful of the plump berries. The skin split, and a honey-sweet juice trickled down his fingers. Suddenly he heard footsteps behind him. An elderly man was moving along the row, snipping off bunches of fruit with a pair of scissors and placing them carefully in a basket. The old man turned and smiled. The old man turned again and looked out over the brilliant sea. 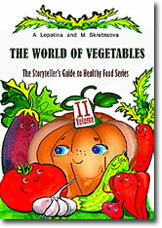 There were white grapes and yellow ones, dark blue ones, and red grapes that glowed with rich purple highlights. When autumn came the vineyard was transformed into a magical, multi-coloured carpet spread over hill and valley. 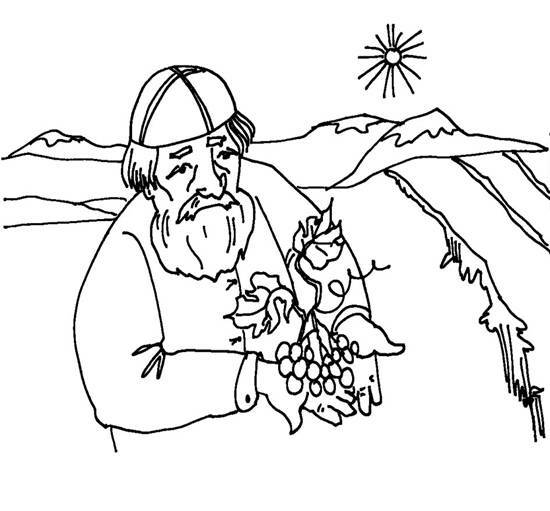 One day he came across some tiny, black seedless grapes – “ Corinth , they're called”, the old man said. When picked and dried in the sun, they turned into raisins. Sometimes the vinesman's wife would bake them into loafs and pies, which somehow tasted best in the golden light of evening at the end of a day's work. “This is delicious!” the young man exclaimed, trying a raisin for the first time. The old man's eyes crinkled in a smile. With that the old man thumped his new friend cheerfully on the shoulder and popped another raisin in his mouth. What does it mean for a gardener to have “good hands”? What kind of gardener or farmer will produce the richest harvest? Ask the children to stand in a circle. Each one of them is a grape. Then ask them to remember their neighbours. Turn on some music and ask them to dance freely around the room. When the music stops, the grapes should come together again in a bunch. If the children get mixed up, the grapes are not yet “ripe”. 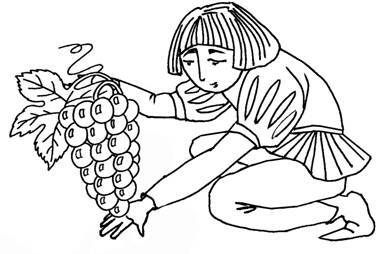 What else did the young man learn about grapes? Make up your own recipe for an “elixir of life”.